The Commander collection, emblem of Mido’s watchmaking expertise since 1959, is expanding to include the Caliber 80 Chronometer, a high-precision model powered by a new, latest generation chronometer movement. Designed to meet Mido’s exacting requirements, this movement has doubled in autonomy, with a power reserve of up to 80 hours. The Commander Caliber 80 Chronometer is the embodiment of perfect harmony between the modern and the traditional: the best of watchmaking innovation combined with timeless design that has had enduring appeal for over half a century. Like the Eiffel Tower for the city of Paris, the Commander is an iconic model for the Mido brand. The Commander collection, with the inimitable character of its fine round case in satinated steel, is as immediately recognizable as the Eiffel Tower, and like the monument, it has withstood the test of time and remained eternally youthful. 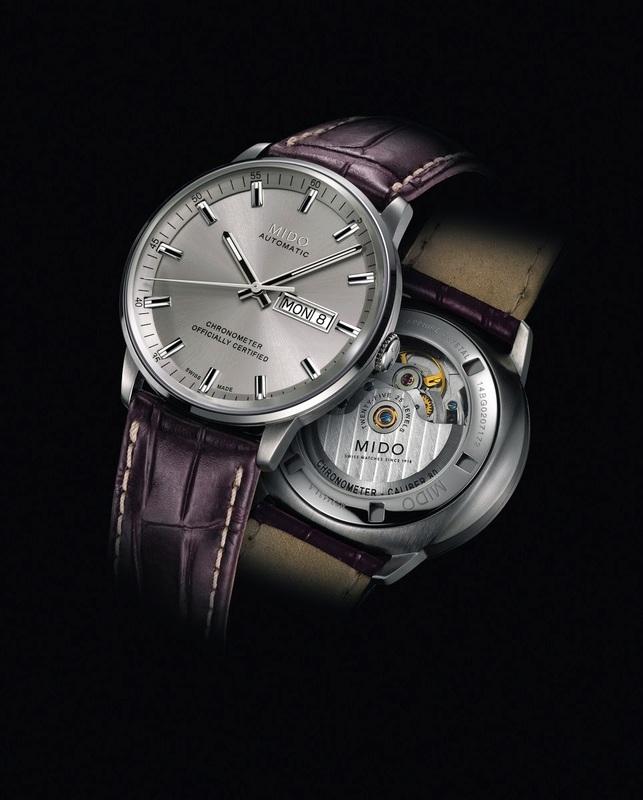 Its exceptionally long life is testimony to its success: the Commander has been in continuous production by Mido since 1959 – its successful formula has been replicated for over five decades. Like the monument that is symbolic of Paris, the Commander has thus become a true icon of Swiss watchmaking tradition and know-how. The purity of its design has made it one of the most faithful interpretations of Mido’s philosophy: timelessness is a mark of true design. Powered by an elaborate finished Caliber 80, the Commander Caliber 80 Chronometer is equipped to meet any challenge. This new movement is certified by the Contrôle Officiel Suisse des Chronomètres (the official Swiss chronometer testing institute) and was designed to meet Mido’s exacting requirements. The result is exceptional autonomy – with a power reserve of up to 80 hours – and unfailing accuracy. The technical qualities of the Commander Caliber 80 Chronometer are complemented by its robust case. A satinated steel case with polished bezel, 40 mm in diameter, is a perfect circle symbolizing the emblematic character of the collection. The rhodium-plated sunray satinated dial is protected by a domed, facetted sapphire crystal. The aperture at 3 o’clock displays the day and the date. An exceptional timepiece, the Commander Caliber 80 Chronometer exemplifies all the watchmaking know-how of Mido: a design of timeless elegance combined with the latest innovations in precision mechanical watch movements. The nickel-plated facetted appliques around the dial evoke the Eiffel Tower and the refinement of its metalwork. For easy reading at night, delicate touches of white Super-LumiNova® adorn the hour and minute hands and the appliques. Water resistant up to a pressure of up to 5 bar (50 m / 165 ft), this model is equipped with a brown leather strap. There is no doubt that the remarkable technical and aesthetic merits of the Commander Caliber 80 Chronometer will appeal to fine watchmaking enthusiasts, who will never tire of admiring the sophisticated decoration of the movement through the transparent case-back. Several different finishes are available for this model. Satin-finished stainless steel 316L, polished bezel, Ø40 mm 3 pieces, faceted and domed sapphire crystal, transparent case back to see the finely decorated and elaborate movement, engraved serial number, water resistant up to a pressure of 5 bar (50 m / 165 ft).